The Human Clock™: Turn on the 2008 news! Cora and I (plus about 12 other people) went and saw the Drive By Truckers / The Hold Steady show at the Crystal Ballroom. After the show Cora spotted Patterson Hood of the DBT. 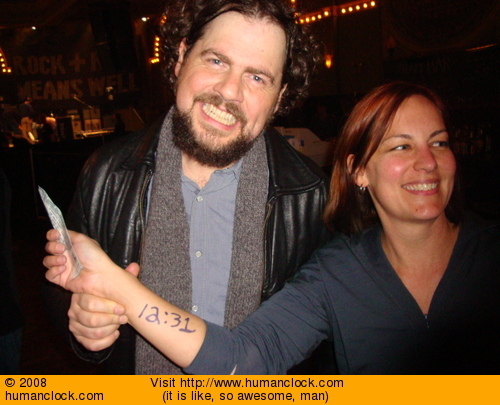 She borrowed a marker from the sound guy and I wrote the time on her arm. Patterson was surrounded by a gaggle of guys asking him music-related questions, so when Cora asked him to take a photo with her, he ignored them for a second and nicely obliged. A guy from Alabama and a girl from Arkansas. Happy Birthday wishes to Sister Teresa. The following is from TechTV in 2004. I didn't know who Cat Schwartz was at the time, but the fact that she thought my old high school camaro was "hot" made me excited that the "girls-calling-my-camaro-hot / per dollar spent on camaro" ratio dropped from $860 to $716.67! This video also shows that I haven't updated the layout of this website in almost five years. And if those were not enough, there are even more videos here. I have the Big Lebowski bike ride video finished in all of its 18 minutes and 54 seconds of glory, but am having to search out another video provider due to Youtube's oppressive time limit restrictions. So check back in a few days for that. In the meantime, Cora and I went and saw Spiritualized a couple weeks ago. That was by far one of the best shows I've ever seen. We were standing about 5 feet away from J Spaceman himself. A long story short, we ended up getting to meet him a couple of hours after the show. I wasn't able to get a photo of him holding up a time, but I did hold out a 12:30am notecard during the show and took one with him in the background. After we were outside I took a few more clock photos. Cora wrote about the whole experience on her blog. I'm glad that she didn't mention how I got all teary eyed during the title track of Ladies and Gentlemen we are Floating in Space. The song reminds me of when I used to have to ride my bike up a bunch of oppressive hills to see her and then we'd fall asleep to that album. A couple weeks ago my roommate Kevin and his friend Kevin organized a Big Lebowski-themed bike ride for Pedalpalooza. I helped out with some of the planning and playing A/V monitor thoughout the proceedings. Below is a group photo that we had some random guy on the street take. If you click on the photo you can get the full-sized version (suitable for framing). I am in the process of getting the video together. Check back again in a week or two and I should have a page up of photos and video. My friend George has appeared in several photos on this site over the last seven years, but now you can see him on "TV". Look for him tonight on the History Channel's "Tougher in Alaska" [link expired]. Cora and I are in Austin this weekend. My friend Kevin told me to go check out this bike shop. We found the address on the map and walked to this bike shop named "Mellow Johnny's". They open tomorrow (May 10th) but they were letting people come in and check it out. 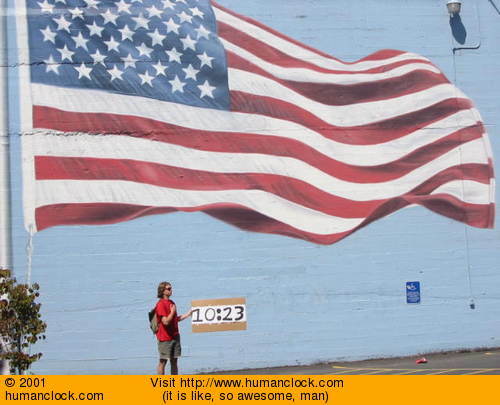 The nice guy who runs it, Lance, just happened to be there so I got a clock picture of him holding up the humanclock cardboard. During the whole time of biking around Australia I stopped at a lot of bike shops and took humanclock photos with the owners, so I figured I should continue the tradition in the US, too. This bike shop was kinda cool in that there were a lot of yellow jerseys up on the wall and such (wink, wink, nudge, nudge). You can see a couple of them in the photo to the right. 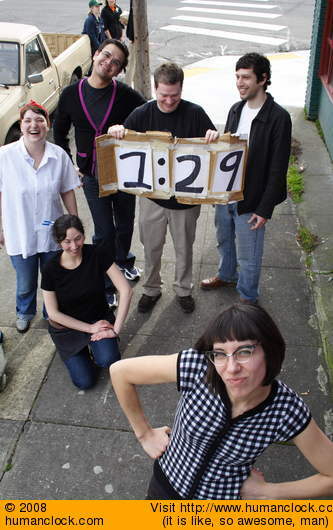 Humanclock is now available for the like-Traci!-check-this-out-OMG-it-is-so-cute Chumby device. Also, #23, #11, #3, and #6 from humancalendar.com all appear in a recent video about a chicken co-op [link expired] here in Portland. No new clock site yet, but a new dog video instead! We rented a Bakfiets from Clever Cycles the other day and I took Cora and Bonzi for a ride. A Bakfiets is a Dutch Cargo bike capable of carrying things such as a child, keg of beer, and pumpkins....all at once. Look for a cameo appearance at 1:00min from the green backpack that carries the clock cardboard. Hey Craig, comb your hair before picture day. Happy New Year 46 days ago! I figured if I left the video of Bonzi in a prominent place for long enough he would eventually surpass the view count of the official video of the Flaming Lips song I used. That finally happened a few days ago, Cora said Bonzi gets a rice and chicken dinner to celebrate. Success has obviously gone to his head in that the other day Cora came home and the large stereo speaker and my 8 track player ($1.00 at a yard sale) were knocked over onto the floor. Seems someone was trying to jump from a chair, to the top of the speaker, to the top of the five foot-high record cabinet...where there was a bag of chips. Anyway, I've been working on a new version of this site. Hopefully it should be online before summer. The current version of the site is about four years old and is quite crusty in places. The new version (4.0!) is a complete code rewrite. I had to do this since a lot of the current code is nearly 7 years old and frankly, looks like it was written when I was 7 years old.